Hi [INSERT YOUR FRIEND'S NAME HERE], Please check this out https://www.proactivehealthcare.co.uk/gut-health/sufficient-c-high-dose-lemon-peach-immune-ade-drink-mix---125-gram-travel-size?referrer=0 and get £4 off your first order (minimum order £30 excl. shipping). Thanks! 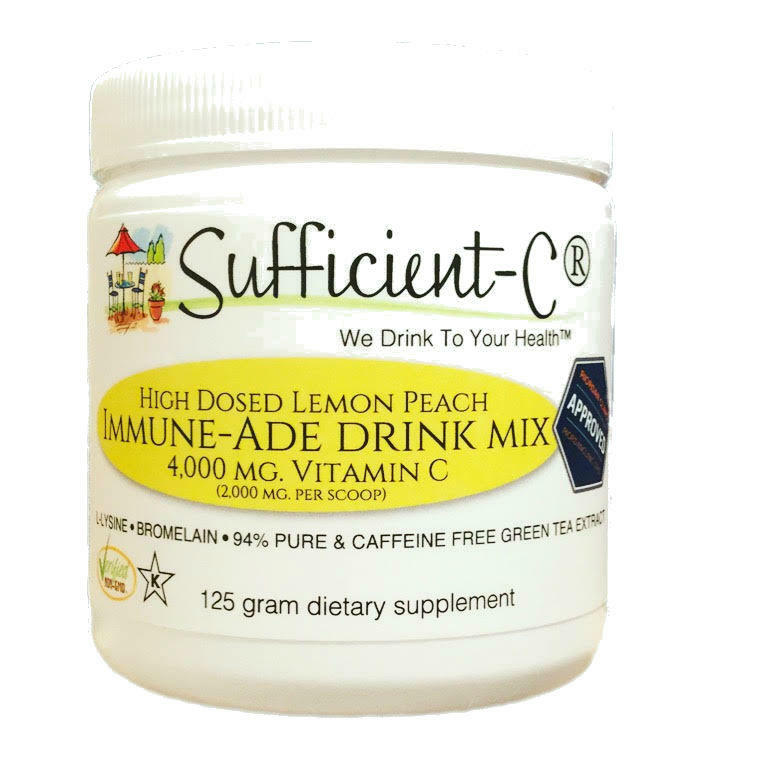 Lean on Sufficient-C® Lemon Peach Immune-ade drink mix for the immune and anti-inflammation support you need and the sweet, satisfying flavour you crave! We understand that Vitamin C is the foundation of health. However ingesting large amounts of vitamin C and other beneficial immune boosting nutrients can be daunting, particularly in the higher doses or for that unforeseen emergency when your immune system needs the EXTRA immune and inflammation fighting support the most. Sufficient-C® has uniquely and naturally combined refreshing flavour with high dosed function. In fact, nothing about Sufficient-C® is hard to swallow! Now you can enjoy the unusual ease of getting up to 4,000 mg. of non-GMO vitamin C ( 2,000 mg. per scoop ) plus generous doses of L-lysine, Bromelain and a 94% pure green tea extract in a refreshing, great tasting, highly immune supportive drink mix! Sufficient-C® goes well with meals, is a thirst quenching treat after a hot workout and is simply satisfying to drink just because! It is 100% water soluble so there are no particles floating about making it aesthetically pleasing and a surprising way to support your immune system throughout your day. It can be very challenging in modern times, getting ample amounts of vitamin C and other beneficial nutrients through diet alone especially when encountering a health emergency. This is unfortunate since Vitamin C is the foundation of immune health. History has proven that the higher, more effective doses are what the immune system needs for the strength required for less susceptibility to viruses and bacteria. In the higher doses, vitamin C is a natural antibiotic, natural antiviral, natural anti-inflammatory and even natural antihistamine. However for medicinal effect, sufficient fortification, spread throughout the day is key. No sugar or sugar derivative has been added to Sufficient-C®. Sugar impedes vitamin C absorption! Rather an organic, premium grade of stevia has been used for a satisfying, compelling sweetness! Now you can kick back and enjoy high dosed flavour with function rather than experience the daunting task of swallowing many pills and capsules. We’ve made it easy for you to get the high dosed, hydrating support your body needs. Flavour with function doesn't get sweeter than this! Non-GMO • Gluten-Free • Vegan • Sugar-Free • Truly Natural • Organic Stevia Sweet! You are viewing the Sufficient-C Travel size option 125 gram pot.